Historic Firearms and Artillery; Mounts, Carriages, barrels, firing mechanisms, historic woodwork, Optical equipment and fittings, ventilators, gun racks, gun tools and furniture. Fixtures and fittings of Historic Buildings; Railings and gates, brackets, fixings and beams. 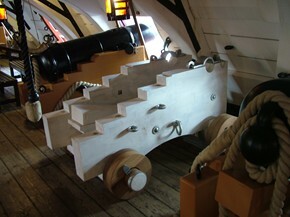 We are an engineering company that specialise in the maintenance repair and conservation of cannons, historic artillery and historic metalwork, we can carry out a variety of tasks ranging from a basic clean and re-paint to complete conservation of un restored pieces including barrel and carriage repairs and manufacture of replica carriages both timber and iron. Working with John Perkins, an armourer of 30 years experience we can supply high quality hand made armour, from a helmet to a full suit, all made to order and individual requirements. Manufacture, deliver and install two 24pdr and one 12pdr "Muller" pattern naval carriages to HMS Victory, the oldest commissioned warship in the world. 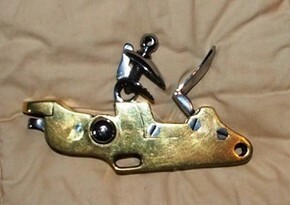 Quality replica cannon lock of the Henry Knock design, as originally made by "Sherwood". These locks were used on cannon in land based forts and carried by famous ship such as HMS Victory and HMS Colussus, originals recovered from the wreck of HMS Colussus, can be seen in the Isles of Scilly museum, St Marys, Isles of Scilly.